When I was in my twenties, I worked at the Hard Rock Café. We would get to work at 10am in the morning to tidy up from the night before, and set up for lunch. The kitchen opened for lunch at 12pm and closed at 3pm. After this, we could eat and if there was enough time before the supper shift started, I would rush home to spend an hour with my partner. He owned a restaurant and our hours were crazy. I was allowed to arrive an hour later than the rest of the staff for the supper shift – but that meant that I could not eat supper. It also meant that I had to make my lunch count. We started serving meals at 6pm and during the week we closed the kitchen at 1am. On a Friday and a Saturday the kitchen closed at 3am and on a Sunday night, relief was in sight, with the kitchen closing at 11pm. Some night shifts saw me getting home, showering to get the smell of hamburger out of my waist length, very thick hair, and then climbing into bed for a few hour’s sleep. On those mornings, there was no time for breakfast. Thankfully there was a very good coffee shop next door to the Hard Rock, and they made the most amazing blueberry muffins. Barbara, the owners wife, and I would get one each morning to have with the first of our many cups of coffee that would sustain us throughout the day. So, when I saw the theme for this month’s mingle on Mele Cotte’s blog (cherries and berries) I knew I wanted to turn my hand to blueberry muffins. Blueberries are in season right now, and this recipe seemed like the perfect one to share. Hi Tandy, just wanted to let you know I made these for the Crazy Cooking Challenge and they were lovely. I’ll definitely be making them again. please let me know what she thinks of them! Golly Tandy, how long did it take your hair to dry after washing it at midnight? Oh, to be young again, it’s probably not the sort of thing we’d do anymore.. 😉 Your muffins look great! I love blueberry muffins and as I’m pregnant at the moment I’m always hungry and need to eat cakes in the afternoon – these will be perfect! Oh my, I cannot imagine you with waist length hair – do share a pic, please. Great recipe! I wonder if I have any? It was super thick and super curly! When I was in my 20s, the Hard Rock was a proper establishment! I remember the days of Serving, but never at a cool place like the Hard Rock. Always wanted to work there. Crazy Fun! Thanks for participating in the Monthly Mingle with these lovely looking muffins. They’re perfect! I worked at a Hard Rock Café too! It was the first one in Spain (Madrid) and I was a member of the first crew (I have a t-shirt and a pin that say so). But I worked at the gift shop. 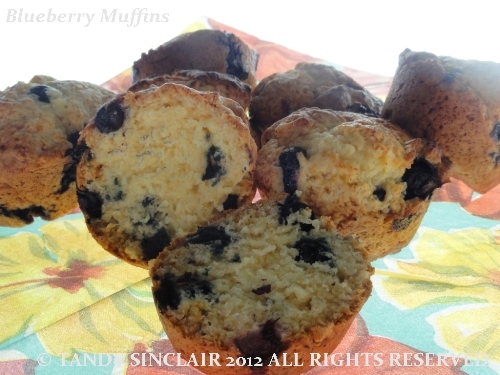 What great looking blueberry muffins!! Fantastic job! Blueberries are definitely top 5 of my favourite fruits! Lucky you! Blueberry season has already arrived where you are! Can’t wait for summer to be here, so I can go back to becoming a berry monster!! I love blueberry muffins. Your fascination with food started at an early age? I hope you are enjoying Cape Town’s lvely weather? Thanks Lorraine, they were really good! I’m still using frozen blueberries -can’t wait for the real thing.